A 1993 life simulation game developed by Japanese studio Gainax. 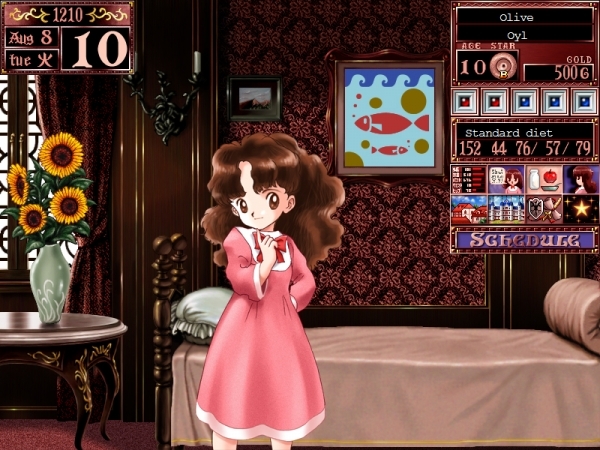 Korean publisher CFK is bringing Princess Maker 2 Refine, an updated version of the life simulation game first released in 1993 by Japanese developer Gainax, to PC via Steam in English on October 3 for $19.99, the company announced. Pre-orders will begin on September 26 and include a 20 percent discount. The Refine edition includes full color graphics and art design, compared to the 16 colors of the original game, and full Japanese voice overs for all in-game characters, including not just the princess, but the butler Cube, too. Steam Achievements and Trading Cards have also been implemented. In the game, player has been entrusted to take care of a young girl by the God of Star. A player must take responsibility to raise the young girl from age of 10 to 18 safely with love and care. The daughter (young girl) will be able to gain experiences from education, part time work, and even combat training to grow. In given 8 years, how and what she will grow into will depend on your method of education and decision, and depending on your decisions, various events may/would occur. Watch the announcement trailer below. View a set of screenshots at the gallery.